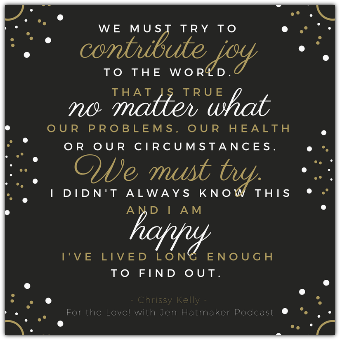 When Jen's Tribe speaks, we get the most incredible guests, and for the wrap-up of our Moxie series, Chrissy Kelly is no exception. We asked you to tell us who you knew that had the most “moxie” – someone who epitomizes grit, determination and perseverance--and Chrissy’s name came up a hundred fold. Chrissy shares her journey as a “Type A” mom, an introvert, a writer, a blogger on her new site LifeWithGreyson.com and a compulsive photographer. 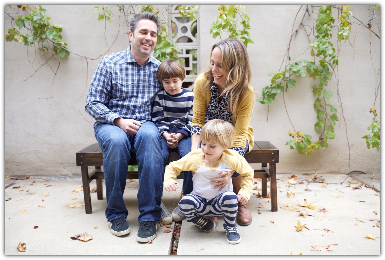 Her “check the box” life was turned upside down when her first son was diagnosed with autism, and just as she started to deal with a “new normal,” her second son was diagnosed as well. Her story is for all of us who have had to pick up the broken pieces of our lives, and find the strength and courage to carry on when it seems we’re dealt more hardships than we can bear. Jen: Hey guys. Jen Hatmaker. Welcome to the show. 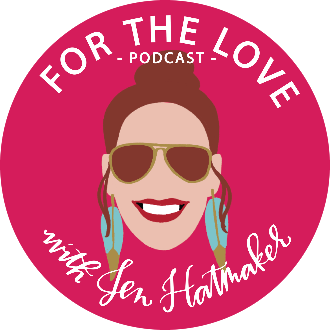 Pleasure to have you join me on the For the Love Podcast. We are wrapping up a series that I have loved and loved and loved and loved. I loved it so much, I extended it by five extra episodes. 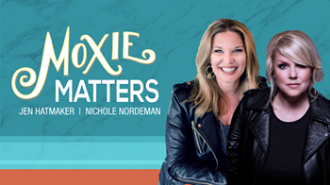 We've been having amazing guests on the For the Love of Moxie series. Women who are brave, and smart, and interesting, and funny, and they've built amazing things, and they've overcome, and survived. Today is absolutely no exception. So you know one thing that we do for the podcast; we crowd-source an episode per series. Since I doubled down on this series, We crowd-sourced two, and so today is our second crowd-sourced episode. I basically went to the tribe and said, “Guys. For the Love of Moxie--tell me who among us has got an amazing story, who's got a lot of pluck,” and the tribe spoke en masse and said, we've got to gal that you've got to talk to. We've got Chrissy Kelly on today. Let me just tell you--you're going to love this girl. So Chrissy’s story caught our attention because maybe--I don't know, maybe a lot of us listening--she said she was living what she would have considered a pretty comfortable, pretty blessed, kind of simple life. A “check the box” life, if you will, until just about six years ago. So six years ago, Chrissy's almost three-year-old son at the time, was diagnosed with autism. So as it does, when you receive a diagnosis that you are not prepared for, that you did not expect, that you're not sure what to do with, kind of everything felt crashy--like crashing down. 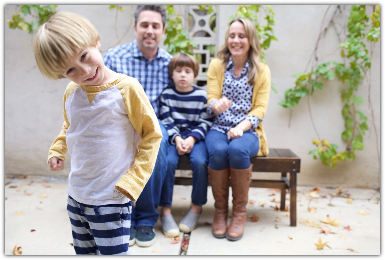 Then, not two years later, her second son Parker was also diagnosed with autism. So her sort of battle, and story through the pain, and the grief, and the disappointment, and then the rising, and the hope, and the recovery, and the restoration, is pretty amazing--pretty life changing. So she's going to share that with us today. So whether or not you've got a kid on the spectrum, or that you're affected by autism at all, it doesn't matter--you need to keep listening, because so much of her story is universal. It's about what to do when we don't get what we expected. How do we finally release what we thought and embrace what we have? So whether that's in parenting or in life, I promise you will find a lot in her story that applies to yours as well. Jen: Okay, so without further ado, you guys, I'm so glad to welcome Chrissy Kelly to this show. Thanks Chrissy for being here. ​Chrissy: Thanks for having me Jen. I'm so excited to be able to share my story with you and with all of your listeners. Jen: Absolutely. It's funny, this is one of our crowd-sourced episodes, which I love because within our own tribe we have enough amazing women to fill seven thousand podcasts for the rest of time. I just knew, going into this podcast world, that I definitely wanted to have people from my own group on the show, so it was great. Your people really love you, because when I said, "Okay everybody, who needs to be, from within us, from within our tribe on the Moxie series," your people came through for you. It was through there that I sort of tracked through to your space into your site, into your story, and I was like, "This is a no-brainer, this is so easy." I'm so thankful that you said yes. Chrissy: Oh, absolutely, it wasn't even a question. Jen: I'm probably introducing you to most of my listeners, and so you obviously exhibit Moxie. This is part and parcel of who you are and how you are living your life. Can you just give everybody the highest 35 thousand foot view of your story, just touch on it, and then we'll come back and dig in, just so they kind of know who you are and why you are so great for this series? Chrissy: Okay. When I reached out to you and shared that I would love to be on your podcast as well, I shared that I had been living a blessed life. It was kind of a check the box kind of life. Life was easy, but I didn't really know it until retrospect. I grew up in St. Louis, Missouri, and when I was 25 I moved to Los Angeles. It was for a boy, it's always for a boy. Jen: And they rarely stick. Chrissy: This one didn't stick. Jen: They're usually in the rear view mirror, those boys, yes. Chrissy: I said, "I'm not moving back to Missouri until I at least try to make it here on my own." I got a six month lease and I ended up staying ever since. I didn't actually meet my husband, very different from your story, until I was 30. We live in Los Angeles, we had an ocean view condo, we both were in pharmaceutical sales, I was making six figures. Jen: I wish more moms would tell the truth about that. I'm serious. Chrissy: "It'll come naturally," they said, "Oh, no." Jen, I was petrified. I was scared to hold the thing. I was so scared that I took my good, easy life and just ruined it. I would look at Greyson and he looked so out of place too, like I was imagining he was in this warm, safe, amazing place and now it's loud and scratchy and itchy and overwhelming too. I remember, he was about six weeks old, and I was rocking him. Suddenly, in that very instant, every ounce of that fear instantly turned into love. I started to sob, like a whole body sob, his onesie was wet. I said, "I don't know what I'm doing, but you're so important that I'm going to figure it out. I'm not going to let anything bad happen to you and we're going to make this okay." I just aid, "You know what," to the husband, "I'm not going back to work. I can't go to work. I'm Greyson's mom." Chrissy: I am done working, and no, we can't afford to live in Los Angeles on one income. Then that's when we moved to the Central Valley of California, no ocean here. I really redefined myself as a stay at home mom. Jen: Yeah, listen, I remember the moment, I remember when we were driving in the car when I was pregnant with my second, I went back to work after I had my first son. I remember I was pregnant with my second baby and my husband was a student pastor at the time. We made like 12 cents an hour, and I was a teacher. I remember saying, "I think that I'm not going to go back to work. I think I'm going to stay home and just raise the baby." He was like, "Is this real? Okay, alright, okay. Let's just recalibrate our life." I know exactly that moment where I just made the same decision for that little season that that was a choice I was going to make. Let's go back to that time. 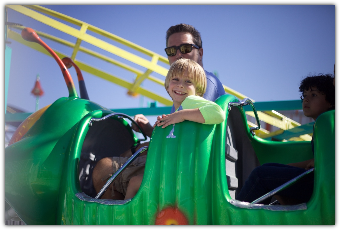 Tell us about that specific season, that time leading up to Greyson, your first son, we'll get to your second one here in a minute, but Greyson's diagnosis. Can you tell us what even led you to have any of this checked out? What were you seeing? What was going on at home? What were you seeing in your son that got you to that first, big milestone? Chrissy: That's a great question. Greyson's about a year old and I get pregnant with Parker. I'm at the end of my pregnancy and Greyson is about, not quite two, and he's not really talking. He doesn't call us mom or dad. He makes eye contact, but it's kind of fleeting. Sometimes when we call his name, I could be five inches away from him and he wouldn't look at me. He would look through me like I was a ghost. I knew he could hear, though, because no matter where he was in the house, if I turned on the TV it made this little chime noise, he would come running. All these things that I just couldn't Google. I'm Googling autism even and I'm thinking, "Well, he's affectionate and he lets me cover him with kisses and he comes to me when he's hurt, so nope, we're good." I would compare every day at the park or anywhere we went with other kids and I always had an excuse for why Greyson wasn't doing something someone else was doing. One evening, literally just a couple weeks before I gave birth, my husband and I had talked about, "Is it strange that he isn't saying mom and dad? It's our firstborn, and I don't know, he'll learn eventually." I just talked to so and so who said that their kid didn't talk until they were four and now he's the president of the United States. Jen: Right, exactly, we'll always look sideways to figure out what's going on in our own life and you can find somebody ahead of you, you can find somebody behind you, but it's funny, you had something in you that knew, though. Your mom instinct knew. Chrissy: I also spent so much time in a little house called denial, so it was so easy to talk yourself out of anything. This night, my husband actually says, "Something's wrong with Greyson." I remember, we were sitting there fully pregnant, I could barely breathe because I had so much heartburn, and this is the last thing I want to talk about. I get mad at him, "What do you mean something's wrong with Greyson," and he said, "He doesn't like to walk on grass," and I said, "Okay, that's weird, that's not even a thing." He said, "He's fascinated with water." I'm like, "Next you're going to say he likes toys and that's weird." I'm not dealing with this now. I said, "If you want to go find a place that we can go and check it out, that's fine. I'll make an appointment with our pediatrician, I don't even know what I would make the appointment for." My husband thinks it's weird that my son won't walk on grass, is that a thing? Chrissy: I was so mad at him. I said, "This is the last thing that I want to talk about, but I'll make the appointment, okay?" And so we do. I make a list of all the words Greyson's saying. Chrissy: Yeah, 25 words on there, they were approximations, they called them, because it didn't really sound like the word, but I knew Greyson-speak. The pediatrician said, "He's probably going to be fine, but we should keep an eye on it because he is at the lower end of language." That was what I needed to go see, everything's good. A couple weeks later my husband said, "I still, I have to push this." ​The first time I came home from the hospital with brand new baby Parker, I was petrified on how Greyson was going to react. He didn't pay any attention to him. Chrissy: I'm like, "Okay, good, it's normal." At the time we set up an assessment with the regional center, most states have a regional center that's non-profit that are there to help people with disability or suspected disability. What they do is they screen children, one of the things that they do is they screen children to see if they are at risk for autism. They don't like to diagnose until three years of age, but if you fail the screeners, they will, the early intervention for every state will make sure that you get what you need to treat the child as is. They will get the speech therapy and whatever different accommodations that are needed. My husband takes Greyson to this assessment and I am at home with my brand new baby. He comes back and he said, "He failed the assessment." I kind of just thought he had a speech delay, literally, Jen, it changed daily and I knew we had a year ahead of us before they would even give us anything definitive. ​Chrissy: We just kind of went along as if he did have autism. We started early intervention preschool, we started speech therapy and Parker was a newborn, so the three of us wrapped newborn baby Greyson, we're figuring this out as we go along. Jen: Are you accepting it at this point? 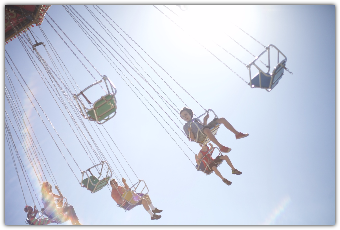 Are you, in your mind, because this is a super overwhelming moment with a new baby and a two year old who maybe is autistic and you're not sure, what was your mental loop at that moment? Were you thinking, "We're going to power through this. I'm going to do these early interventions and we're going to push him through the other side." Can you remember what you were thinking during that season? Chrissy: Heck yeah. When you do something, I'm what I call a life enthusiast, I'm going to do it full throttle. I'm going to get a label maker out and I'm going to get folder files and we're going to do this. What I'm going to do is just get him all the supports that he needs. He's going to be talking, I'm going to go back to all these early intervention folks, who are amazing by the way, but I'm going to be like, "See you later, suckers. Everybody was wrong and thanks for your hard work and for your help, but we got this taken care of," so that's what we're going to do. Jen: That was a really good plan, I really like that. I've made some similar plans in my life, they're all garbage. They're in the dumpster. Jen: I have a similar mindset. I am dog on the bone when I want to be and certain that I can just, by will and grit, make a circumstance be what I want it to be. Everything you're saying feels so familiar to me. Fast forward just a hair, let's get him closer to the three year mark. At what point do you receive a confirmed bona fide diagnosis, "Greyson has autism." Chrissy: There's two steps in this. Number one, when I was full throttle, everyone and their grandmother tells you what the next cure to autism is, like we need to try these essential oils, "You need to try this diet, you need to do this." We did it all. We went to fancy doctors in Santa Monica, we did everything we could even think of. I researched it non-stop. I finally had to stay away from chat rooms, nothing good comes from that, absolutely nothing. I would Google until my eyes bled and then I would wake up and I would do it all over again. At one particular point, Parker was four months old and Grey was about two and a half, and I'm still living in this gorgeous land called denial, but I have a purpose, so I feel purposeful. I feel like I'm making progress, Greyson's making small strides. On one of my Google binges, I came across a checklist for autism that was very different than all the other ones I had taken. What they had said was, "A, does he ever bring anything to show you and to get your attention?" Chrissy: I see that, that's a social skill. That's there in the joy of an object, or I want that, or that's neat, or that's scary. Another thing he did, he would always look at things from a centimeter away, closeup, and I thought that was a Greyson thing. Now I know it's not, it's a spectrum thing, so I saw that. Jen: So interesting, and you've never seen either of those on a checklist? Jen: Those were new red flags, yeah. Chrissy: I remember I was wearing a green hooded sweatshirt and I was in my bed and Parker was napping, and Greyson was in therapy in the house. It was probably the most gutted I've ever been. Jen: Even after all that work you'd logged, that was the moment. Chrissy: That was the moment that a door to reality opened, like from denial to reality. It was too much at once. It was way too much. I sobbed, I sobbed and I sobbed and I sobbed for the future and for the past of not knowing. I just, that was the first moment I kind of knew, actually I did know. I knew that was going to be a reality and thankfully, or I don't know if it was thankfully or not, but I was able to go back and forth to talking myself out of it a hundred times in the next six months. Fast forward to diagnosis day, Greyson's almost three and I really want this one specific doctor to meet us for the assessment, and so they say, "Okay, you need to be available at this time, this day, that's the only way you're going to be able to see him," so I'm like, "We're going to make this happen." I take Greyson and I make sure he wears a shirt with his name on it because I wanted the doctor to remember that he was a little boy who loved trucks and playing outside and he wasn't just a name on a chart. This psychologist, he was a really amazing man. I told him, "If I had met you in any other circumstance, I would really love you, I think." He had a mustache like my dad and he felt like home and he was just so smart and he asked the best questions. I filled out all these empirically validated little screener tests because most of the diagnostic testing for autism, there's no blood tests, there's no labs, it's evaluations and assessments. He tried to get Greyson to put together a puzzle, a very simple three piece puzzle, and he couldn't do it. I got on the floor, I'm like, "He's using too many words. If I just explain it to Greyson, he's going to get it." Up until the last second I am trying to take control of this bus that is about to crash. My husband travels for work, and so he was gone, but I had heard that it took the doctor weeks, sometimes even months, to issue a report. I'm thinking, "Okay, I can motor through this. It's going to be two hours, it's going to be hard, this is all stuff Greyson doesn't like either, being forced to sit, being evaluated and sitting in a small room, but I can motor through that and then leave and lose my marbles, but I can handle the two hours." As he's sitting there, I said, "So, how long does this take for you to issue a report or to let us know what's going on with Greyson?" He said, "Well, I can tell you today, but if you don't want I won't tell you today because your husband's gone." For a moment, I was scared to death he wouldn't tell me. Jen: I bet you were, yeah. Chrissy: I was like, "If he knows ... I'm his mom, I must know right now." I said, "Listen, I've got superpowers, I can handle whatever you say to me and I'm ready to hear it." He looked at me with the kindest eyes and he said, "Chrissy, your son meets the diagnostic criteria for autism, but I want to tell you, I don't meet a lot of parents like you. Everything you're doing and everything that you've done, he's going to be good. He's going to have a good life." Jen, honestly, I got out a pen to take notes and I looked at the notes later, they were squiggles. I don't remember anything. I remember the air went out of the room and I remember my teeth were tingling. I remember I was talking to myself, saying, " You need to pay attention. You need to pay attention," and I just couldn't because before my eyes, it was like Greyson's not getting married, Greyson's not going to college, Greyson's not going to play baseball. Everything that I had dreamed into existence, autism edited out of my life in an instant. He explained it so well, Jen. He said, "Basically to get an autism diagnosis, someone needs to have core deficits in three areas, communication, socialization and behavior. Behavior isn't just like good behavior, bad behavior, it's routine, are you flexible, are you able to sit and learn, are you able to learn how to brush your teeth, all those things." He said, "Greyson's going to get help in those three areas for the rest of his life and it's going to make a difference." Jen: Oh, man. I love him. I wish he was my neighbor. Jen: We're going to get down to the rest, there's more, listeners, there's more, hang on. I want to press pause right at this moment in your story because I'm thinking, as you're talking about how many other parents have, be it through autism or being on the spectrum or any number of circumstances, any number of unexpected changes or scenarios that present themselves in parenting, find themselves in a place where they do not have, with a child, in any way what they expected? They had a story written, it's the story most of us have bought into, and then either biologically or neurologically or even circumstantially something happens, all of a sudden they find themselves on the outside of their story. Can you just talk for one second, because we're going to come back to it because you've just, you're on the Moxie series for a reason, there's a beautiful rising to this trajectory, but can you talk for just one minute to the woman or the man listening who finds himself in the parenting space where they are you. They're in the teeth tingling, "I can't read the squiggles on the paper. I can't breathe," they're in shock, they're in grief, they don't know what the next step is going to look like as their dreams have dissolved and they haven't yet built a new one. Can you talk to a person in that space just for that moment, how would you advise them? How would you lead them? What would you say to that mom sitting there with her dreams in shreds in her hands? Chrissy: A lot of times people say, "What's your advice for," whether it be autism or, like you said, any life circumstance, and I always say, "I'm not going to give you any advice because your story is going to be very specific to you and your precious baby." As far as, "You need to try this therapy or this, or this diet," let's throw all that aside and let's just sit here for a minute because what we really need to do is mourn that life, that story. Jen: Thank you for saying that, I think we're really bad at grief, really bad. Chrissy: We need to motor through, "We can fix this. I'll stay up all night and I'll fix it." This was the first thing I couldn't fix, and so I would say, "Let's just sit with this pain and let's cry and let's do whatever we need to do," because if you don't mourn whatever story you had originally written, you're not going to be able to create a new one. Jen: That's really good, and that's not, there's nothing wrong with you listeners if you are in the grief space. That's real, that's a loss of what you expected or what you hoped for and it doesn't make you weak or shallow or any of that. If you're in that little season, and it is, I believe, short. 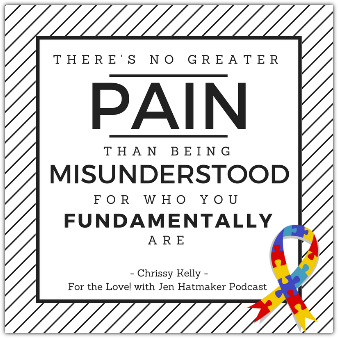 I believe we are incredibly resilient and able to pick up those threads and weave them back together into something beautiful, but I think it's good for us, too, to remember, as we're listening to your story, Chrissy, to let our friends grieve sometimes. I bet your people tried to hustle you through it, too. I've done that. I've been on the receiving end and the giving end of that, pressure to, "Okay, well let's make a plan. Let's get it on paper. Let's get some steps and some systems and some programs. We're going to figure," and there's a place for that, but I think it's a discipline to offer to the people in our lives, our communities, our friends and our family members, a little bit of room to just be sad, to just grieve and mourn a little bit and sit with the weight of the loss before hustling them through to the program. ​Jen: I want to come back to your story because, so this is where you're at, you've got a legit diagnosis at this point. Can you explain to everybody what came next, specifically with your second son. Chrissy: That moment I had told you about when I first had that door opened to reality and had the first inkling my son was going to receive an autism diagnosis. I also looked up the prevalence of autism in siblings because I'm thinking, "This doesn't happen twice in one family, right? What's Parker's future going to look like?" I saw that the overall prevalence of autism is one in 68 in the general population, but it's definitely getting much more prevalent, but it's one in five for a sibling, so the odds are significantly higher. I think this is an area of life where Moxie absolutely came into play because, at the time, Parker was four months. I knew I wouldn't see anything until he was probably 15 months, because now I had an eagle eye. I knew what to look for, but from four months to 15 months I had this talk with myself, "You will not waste his babyhood analyzing him every second of the day, checking his development, seeing if he's pointing. You will not waste this most precious, most hardest time in parenting on his future because it does not exist." There were days that I struggled with that. I would say, "Michael, I called Parker's name four times, he didn't look." I did not do this perfectly, but that was my commitment. Sometimes I had to make that commitment every morning when I woke up, "Today I will focus on today." Parker was very different. His eye contact was different, his communication was different, but I feel like I always knew. I just always knew. From that green sweatshirt moment where I ended up wearing that sweatshirt for like four days and I couldn't function, and I couldn't eat, and I was nursing Parker, and I had no idea how I was I making milk because I felt dead inside. I really was able to bottle up all of that stuff, put it in a box, put it on a shelf, and say, "We're going to deal with you when Parker's 15 months old." When he was, his first birthday, started to get little clues, not curious about strangers, not scared of them either, not excited about them, just a lot of red flags and not talking, not calling us mom or dad. We had him screened as we did with Greyson his first time around, and this time I went with him. I wasn't there for Greyson's because Parker was just two weeks old. The funny thing is, it was about probably 20 months later, so I had started to heal, but there was this scar that just, I had to rip it all open. Chrissy: Rose back up. I call it stepping on shards of glass. Once I broke this pitcher of lemonade in the kitchen and glass went everywhere, so for a week we were super cautious and vacuumed and mopped and swept and swept every day and wore shoes in the kitchen, and we were good. A few weeks later, I walked in the kitchen and I got cut on a shard of glass that I thought was gone. Those shards of glass come up in life. Where you think you got rid of the entire mess, and then one tiny thing makes you think that you regress, "I never healed. I'm not okay." I came upon a few shards of glass. Jen: Sure enough, eventually, Parker gets a diagnosis as well, right? Jen: Here you are, you've got two boys. At the time, how old was Parker when we has pretty formally diagnosed? ​Chrissy: He started all the interventions at like 19 months. Jen: Okay, so you were kind of with him too. Here you are, you've got these two boys, they're under five and they are both diagnosed at this point with autism, which is certainly not what you expected. I mean, this is not what you thought your motherhood journey was going to look like certainly. I'm thinking of how many of us have sat in that exact space, maybe with different circumstances, but super similar perspective. It's so tempting, to me, to despair or we've had some stuff with kids too. My youngest two are adopted and they learn differently and their trauma is invisible, but incredibly present. 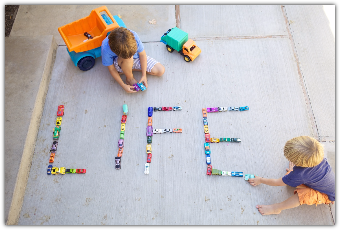 A lot of things are not atypical and what looks one way on the outside isn't necessarily how to parent them or how to teach them or how to socially ... There's landmines everywhere, so many landmines. Jen: Sometimes in that moment, the temptation to lose our faith in God or in fairness or just in justice that one family would have to take so much on, to have two sons diagnosed with autism, so let me ask you this, after you've sort of sifted, you got out of the green sweatshirt eventually, can you even point at, maybe more than one thing, it may have been a process, however you want to answer it, but what sort of snapped in place for you when you realized, what happened? 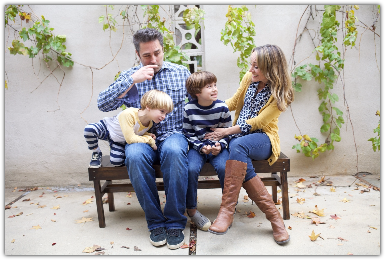 What switch flipped when you said, "I cannot change this diagnosis for either of my sons, but I can change how I respond to it." How did you find your way out of that pavement. Chrissy: So good, okay, so there's two parts to this. First of all, I just remember vividly walking into Greyson's assessment at the regional system I had mentioned and the entire outside of the building was mirrors. Of course, we were in a hurry and dropping things and just an absolute mess walking in there, and I just remember us walking out and Greyson was fascinated by sliding doors. 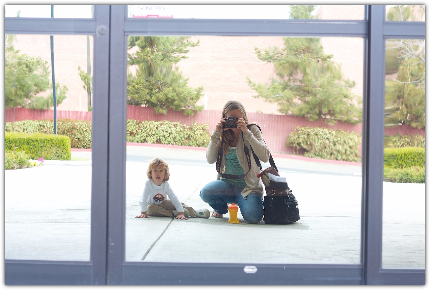 We just sat there for a moment and he watched the automatic doors open and close and I caught a reflection in the mirrors. I was shocked that we still looked exactly the same because our whole life had changed. I took a picture of that mirror and of us, because I knew one day I would look back at that day and be in a totally different head space. Up until then, my entire mantra was like, "We're going to beat this. We're going to fix this, we're going to change this." That was the day I realized it didn't work and it didn't happen and I didn't stop him from getting an autism diagnosis. Jen, it was so funny because I said, "Okay, well I couldn't change the fact that he had autism, so I'm going to change the world." I was so excited, and I thought changing the world was going to be easy. "This is great, I cannot wait to start on my first list." That was my first flip flop of the brain. Here is my second one, and it's one of the most sacred moments of my life. We live by the San Joaquin river and with Greyson and with Parker I kind of was living this parallel universe life where they made eye contact, we went to birthday parties and they actually had a fun time, we didn't have to leave, and they would ask me funny questions and I would repeat the funny stories they told me and they would ask for pancakes, the life that I had thought I would have. I constantly have this loop running of my parallel life, and I was pissed. I felt like somebody took away what I thought motherhood was going to be for me. One day I woke up and I thought about my parents. My parents have been married for 50 years and they're amazing people. I wondered, "Did they ever wish I was something else? What if they wished I was something else every single day?" Chrissy: Devastating. What if they wished I was a better cook? I'm not a good cook. What if my husband was constantly wishing, "Oh, Chrissy, if only she was taller," I'm only 5'2". That would be, there's no greater pain than being misunderstood for who you fundamentally are. ​Chrissy: Jen, it was good because it absolutely changed how I think about everything, but it was so painful that I had been doing that, and you know what? I forgive me for that, that's where I needed to be then. Chrissy: I said, "I want to take the boys today to the San Joaquin river. I want to take off our shoes and I want to walk through the river and I want this to be their new baptism. Chrissy: These are the boys that I had, not the boys that I daydreamed into existence, these are the boys that God gave me, and by golly are we going to celebrate them exactly the way they are. Jen: I just cried my eyes out. Chrissy: Jen, it was so, God, He was all there, all there the whole time. All the times I thought He forgot about us, He was there crying too. I said that day, those daydreams have to stop. You get a hit when you have them, "Oh, golly, yes," and then you feel awful and I said I just need to stop it. Jen: That's good. You let go of what you expected and you embraced what you had. Jen: It's gorgeous, and your sons are gorgeous. Jen: And they're beautiful and you've got a beautiful life and a beautiful family. I am so glad that you've shared this much of your story up until this point because it's all a necessary part of it. You couldn't just get to that river moment, you couldn't. You had to have the green sweatshirt days and you had to have the teeth tingling days. You had to have those, that's part of the deal. I think sometimes we look at other people's stories on step 12, but they're still back at step two going, "Why can't I be that joyful? 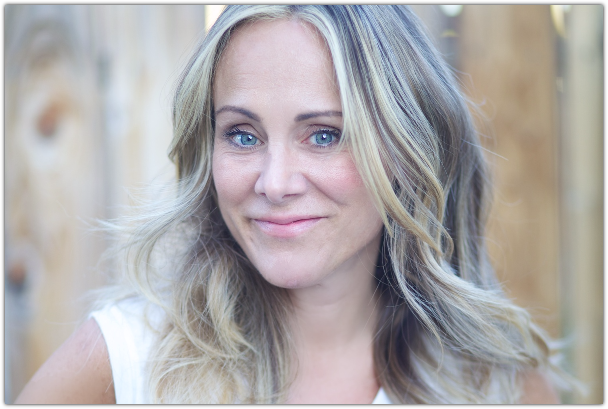 She's made her peace, she's figured it out, she's decided what her new ..." I just think there is a grace for the process that, in parenting in general, listen, even in the most neurotypical ways, parenting is going to throw you so many curveballs. I know this now because I've got college students and high school students and I just, I also had a certain path that's going to go like, "This, this, this and this, we're going to put in these, these, these and these ingredients and then life will spit us back out kids who do this, this, this and that," like we had a formula. ​There is just a truth that sometimes dealing with suffering or pain or shock or confusion or failure or whatever, it requires this readjustment and there's grace for that. I hope everybody receives that from your story today, that no matter where they're at on their parenting story, that what they're feeling today is okay because the good news is, why I love putting somebody like you in front of everybody, is because you show us what's possible and you show us a true reflection of what it looks like to go through the steps, to grieve and to deny and to accept and finally find joy. Going back into your story, you started building your new normal. You said, "That's it, we're walking through the river, this is the new baptism." This is what we have. Specifically in terms of autism and kids on the spectrum, which are, I can throw a rock and hit a dozen people I know with kids somewhere on the spectrum, it's a really common story. Even outside of that, I have three times as many whose kids just are not typical learners for a variety of reasons, and so you have a lot to offer all of us. What were some resources that you started tapping into or people that were really key to supporting you during that season? How did you rely on them? How did you find them? Who were they? What did you start learning? Chrissy: I started learning that there were two ways to look at this. 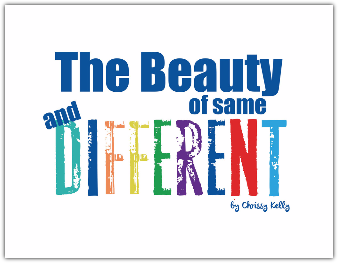 We could look at our kids who aren't typical learners as broken normals, or we could look at them as their own selves. The movement is kind of called neurodiversity where instead of saying, "Okay, this is how we teach typical learners, so let's modify it and then let's do this and then let's do that for kids with autism," or whatever that specific thing might be. 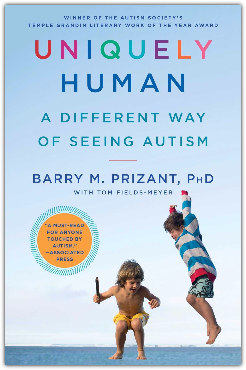 There's also people who look at autism in a very empowering way, and it is, "These learners are very unique. A lot of teaching kids who learn differently and a lot of parenting kids who learn differently is the opposite of what you might expect." Jen: How so? Explain what you mean. Chrissy: It's like one of the things, if a child does something for attention you are supposed to ignore them. That goes against, it's counterintuitive to anything I thought I had learned about parenting. If Greyson is hitting me or throwing something, I would say, "You've got to quit that. No hitting, no throwing." Well, when it comes to behavior, and this is behavior, it's highly studied, this is for everyone, but it's heavily applied in children who learn differently. A child who does a lot of things for attention, you actually withdraw that attention. You stop feeding that behavior. Jen: I love that approach, period. Chrissy: Yes, absolutely, like play, I still feel when I'm learning about something I'm passionate about, it feels like play. She helped and we, that kind of helped how I shaped everything. I remember we went to visit a school once and it looked clinical and depressing and yucky, and I said, "I don't care that my son has autism, this, if he's in preschool or kindergarten or whatever it is, it needs to look like joy," because they're professional learners, they're going to be having to work extra hard to learn all of their life, we need to make it fun. Jen: I love that. What did you find school-wise? Are your boys in public, are they, did you have them in a private school? What worked for your family? Chrissy: This is something that changes every year. We can't get too comfortable with anything. Jen: I like that. I love it too, I like that you're going year by year, and even kid by kid. Chrissy: Yup, and day by day sometimes. Parker just started school. He is also a life enthusiast, so he has the highest joys of joys and loves singing, and he calls us mom and dad and he negotiates for pancakes, so some of those dreams that I let go of, they came back to me. Chrissy: Yeah, and that kind of reminds me, "Don't close the door on anything. Anything is still possible." Chrissy: Greyson has a little less bounce to his step, so we're doing the best we can. Like I said, it's just day by day. I think we can all agree that educators and teachers are some of the most incredible humans on the planet. Chrissy: I focus on these amazing people who give my sons the gift of knowledge and patience and information and love. Most of our teachers spend more time with my kids than they do with their own kids. Chrissy: I think that the system, if you will, is a little broken. I think there's some allocation of resources that needs to be channeled into special education and it's something that I advocate for, but at the end of the day, we celebrate our teachers and we're so grateful for the people who love my boys like we do. Jen: I like that. I like working within the system, in partnership with our teachers and administrators, while also putting pressure on the points that need pressure. Jen: I remember, I can't tell you how much I identify with this, I remember staying in a room with my kids' teachers and their principals when they were newly in America, so we barely had English, language acquisition was on the table and we were still deep in the throes of grief and healing and trauma. Adoption is similar and teaching and parenting adoption-related trauma is not unlike some of the things you are saying. It goes against some of our intuition, so some of the things that you would say, "This is the thing to do," is the exact wrong thing to do in that scenario, so I remember having to say things like, "Don't hold her hand," and she's in kinder, she's a sweet baby. They're thinking that's precious, but I'm trying to work on attachment. I remember having to educate my teachers and my principals on what attachment- related trauma looked like. I'll never forgive them sitting around that table with their notepads out, taking notes. It's so tender, it's so precious to me, so at the same time I'm like, "I'm your girl, we will work together. I will provide you any resource you need." There's something about working within the system while also elevating the system at the same time to say, "Here are some places I think things are broken and this is what we can do about it and I'm still on your side." I think because, of course, how you and I advocate for change for our kids, that bleeds out to everyone's kids. What's good for ours is good for everyone, and so advocacy, it's never wasted. Never, never, never, and it's probably exponentially more important than we even know. So back to you. Tell us when you started writing about your experience. My antenna goes up because I'm a writer too, so why did you decide to start writing about your experiences with the boys and your sort of motivation there and what did those early days look like? It's one thing to live it, it's another thing to message it out to the world. Chrissy: Right. My blog first started because my whole family lives in Missouri and we're in California and I wanted to be able to share stories of what was going on with just Greyson at the time. It was the grossest writing I've ever, it's so cheesy, it's hilarious when I look back on old blog posts. Jen: Oh, yeah, despair, absolute despair. Chrissy: See, I'm lucky. I have way less readers, so only a few people saw my disgusting offering of what I thought a writer should sound like. That's how it started, and I believe between six and eight people read my blog, and that's what it was for, though. That was it. When I started to have that inkling, the green sweatshirt, I was pressed with this reality that we were about become a sentence. I had made people sentences numerous times in my life, when you're out to lunch with a friend and you say, "Did you hear about Susie and Tim? Mm-hmm (affirmative), you did? I know they're getting divorced. Oh, that's terrible, so do you want to share an appetizer?" I didn't want to be a sentence. I didn't want to be like, "Did you hear about Chrissy Kelly? She has a son with autism and I think that her second son might also have autism." Chrissy: I said, "No, I'm going to write the story and it's going to be so much longer than a sentence. I'm writing our story," so I started to write it. I felt like I had something to prove. In retrospect, I didn't, but writing is such a good way for me to organize my thoughts and my heart and to connect with others, and think it's part of my type A OCDness where my thoughts are so jumbled and constant in my head and I need to get a siphon and squeeze them out into something that might feel productive. Jen: Yes, I love that. I, of course, exactly understand that. Sometimes when I sit down to write, I'm not even sure what I think about the thing until I put my fingers on a keyboard and find it. I find the thread in the jumble and it sort of smooths out. I'm sure at this point now, you've been writing for ... How long have you been writing your blog? Chrissy: Years, probably five years. Jen: That's what I thought. You had to have heard back from thousands and thousands of people who are inspired by your story, who are living a similar story, who have questions, I'm sure. What has that been like to now handle all that feedback, good and bad? Chrissy: It's been amazing and it's part of the life, I'm living life on a different level that I didn't know existed before and it's much deeper and it's much messier and it's much more beautiful. To hear feedback from people, my favorite is just a, "Me too," from someone. A lot of them, I think we realize when we share our stories, that we all have so much more in common than not. Of course, I would say half the people that read what I write or follow our story are affected by autism in some way. Maybe they're a teacher, maybe it's their child, maybe it's their niece, and those people are my family. We share things in common that are very intimate, but I also love to hear from people, because if you're going to change the world you need to talk to people who already aren't onboard, so I love to hear from people who aren't affected by autism, but they can relate to the love I feel for my boys or they can relate to the pain of being afraid you would never laugh again. Maybe, a parent I've had, a lot of parents contact me their child came out. They too had to learn to edit their life and get rid of that first story they were expecting and really embrace the story they were given. When I hear someone's able to advocate easier at school or accept the life they've been given, that's my favorite. That's just my favorite. Jen: Oh, it's so good, it's so phenomenal. What a gift, and to you, to the boys, to your community. I mean, really, it is so ... Nothing thrills me more than to see all these beautiful things come out of what, once upon a time, felt like a pile of ashes. At one point, and yet I love, love, love how you say to the people watching you and reading and listening, "You'll laugh again, I promise you will." It's so good to throw that lifeline backwards to the people who are not yet standing in the laughter, who are still back holding it all, going, "What am I going to do? Is my life ruined? Are their lives ruined?" That part of your story is absolutely universal. Anybody listening can be inspired by that and moved by that. I like, let me just ask you one last question and then we'll wrap it up here, I like how you find this, you talked about finding beauty in the unexpected. Like we've mentioned, a lot of us have been blindsided by circumstances that we didn't expect, but you've hit on something really important. What if, and this is a part of my faith so I just believe this to my bone marrow, what if some of these greatest struggles, these awful sorrows, these things that we did not want, did not ask for and we did not expect, turn out to be gifts in disguise? What if those are the very things that turn into gems and treasures in our lives, in the arc of our story, and you encourage people to look for beauty in the places that hurt. It's important. Can you just talk about that for one minute? Chrissy: I have realized through life with my boys it's strangely the closest to God on Earth that I have ever felt. I'm a very literal person and I really, really like the things that I can touch and hold. I have been able to touch and hold and be hugged by God because of them, because of when I see certain therapists interacting with them, because of things that have happened in our life. We were on the national news because my son struck up a relationship with our garbage man four years ago. ​I'm talking to you right now, Jen, there are things that would not have happened in my life if it hadn't have been for autism. I just, I can't imagine if I never would have gotten past that pain part because I would have missed out on all this part, and this is the stuff that gives me the chills. This is the stuff that makes me cry because it's so beautiful. This is the stuff, you know? Jen: This is the stuff. Chrissy: This is the stuff, this is why and it's a packaged deal, so you can't just have the good and easy, you've got to take it all. When I look at the whole package, I am so blessed and I think it's because I'm willing to see what good comes out of the pain. One of my favorite quotes is Roger Ebert, he says, "To make others less happy is a crime. To make ourselves unhappy is where all crime starts." We must try to contribute joy to the world. That is true no matter what our problems, our health or circumstances, we must try. I didn't always know this and I am happy I've lived long enough to find out. Chrissy: That's why I look for joy, because it's why I'm here on Earth. That's what God wants. Jen: It's gorgeous, bravo. This is me clapping. Chrissy: This is me bowing. Jen: Marvelous, I can't wait for everybody to go to your site and to see the boys and to see what you do. You're incredibly knowledgeable about autism and resources and you're a really good mom, really, really good mom. I applaud to you. You stepped into a space that you weren't prepared for, but you have taken the bull by the horns and I'm looking at your boys and thinking, " Man, they've got to get advocating their mom." Jen: I'm really proud of the way that you're parenting and the way that you're living and the way that you love them. You're going to be an amazing inspiration to so many people listening. Let me ask you a quick down and dirty question that we ask everybody at the end of the Moxie series, and this doesn't, it can be related to what we've been talking about, but it doesn't have to be at all, and it can be serious or it can be absurd, so don't, it doesn't have to be precious. Chrissy: Or it might be a little bit of everything. Jen: It could be all of it. I t could be messy and moxie, which is my life. Besides the ones that we've talked about, can you name a messy moment that you thought, "I mean this, I may not get through this one," and you've soldiered through and got to the other side and what did it teach you? Chrissy: It is something that we touched on a little bit and it was our first year living in the Central Valley. I didn't know anyone and finding mom friends is like dating and you have to kiss a lot of frogs. I had no real friends that I can just be down and dirty with. My husband's traveling for work frequently, the stuff's going on with the boys and my family is thousands of miles away. That was the messiest time of my life as I'm trying to figure out, "Where do we go to therapy? Where do we go for the speech? Where do we do this? What's the school district like?" I don't know who to ask even. That was the messiest time of my life because it was a big lesson in beating the control freak out of me because absolutely every single ounce of it was out of my control, so that is absolutely the one thing it taught me, that you're really not in control of everything except your attitude each day and you just need to declare to Jesus you are faithful and you will get me through today and tomorrow let's have the same chat because I'm going to forget, okay? Jen: That's right, I'll be mad at you by tomorrow morning, so let's reevaluate and come back to ground zero here, yes. Chrissy: Yes, so that was the messiest. I love stories that are like, "Okay, so this happened and it was really bad, and then it was broken, and then everything was fabulous." There was no fabulous in that story for a period of at least six months, you know what I mean? Chrissy: It was just, no silver lining. Chrissy: Yeah. I would say if there's no silver lining, you should sew one in, but my sewing machine was broken, so that was my messy. Jen: Yeah, but you found it, because that's where you live and you're thriving, so you did find it. Let me ask you one last question, this is a question that Barbara Brown Taylor posed once, and it can be anything at all, what is saving your life right now? Chrissy: Jesus Calling the first thing when I wake up. Before it was Facebook and coffee and the Today show and it was not, it was, again, a nice hit, but not long sustaining sustenance, so for sure Jesus Calling - the Devotional. I read that, I stretch my bones because I've got bad joints, I love on my dogs because they know a lot about life that we don't know yet. Of course, always television because nothing makes me feel more sane than reality TV. Look how good I'm doing. I don't even want to say it, but it might have something to do with The Real Housewives and with The Place, I don't know. Jen: It's okay, that would not be the first mention of Real Housewives on this podcast, so you are in good company. Sometimes that is okay to have an absurd little mental escape, that's fine. Chrissy: Not only is it okay, it is medically necessary. Chrissy: I like to eat my feelings. Jen: Oh, yeah, sure. I'm familiar with that approach to life. Chrissy: Literally those, you know what I call it? I call it the dot. You know when you get a coffee from Starbucks and it has that white lid? Chrissy: There's a little dot, a perforated dot. You ever noticed it? Chrissy: That dot is what ensures that the coffee comes out of the spout and that you don't get burned and that steam is released. That tiny dot is what I make sure I have in my life. Jen: Yes, whatever it is at the time. Chrissy: Yes, some days it's Starbucks, some days it's a quick retail therapy or whatever it is, I make time for the dot. Jen: I like that, fabulous. Oh my gosh, I'm going to tell Brandon that and that's also going to be my next excuse. Jen: Thank you. Thanks for sharing your story, thanks for talking about the boys, thanks for being so honest about the parts that were hard and the parts that are beautiful and they're all kind of the same. Listen, everybody, everything that we talked about is going to be on my website, all the links, all the everything. If you heard about it, you can find it there. Chrissy, what a pleasure to meet you and to have you on here. I just enjoy talking to you so very much, I feel like we could talk for another 10 hours. Chrissy: For sure. Thank you so much too for listening to my story. It's such a, it's an honor, it's a gift and I truly cherish it. Jen: You're welcome. Okay everybody, go to the website, get everything you need there and you will love having more Chrissy Kelly in your life. Alright, sister. So guys, that was the For the Love of Moxie series wrap up, which I enjoyed just so very much. So amazing to be with the caliber of women that we had on the show for that series. Now I am super-super excited to tell you about our next series coming up, and it will not surprise you if you know me at all. Of course there's my train. You know that the train is a part of this podcast, so make your peace with it. There's no getting around it and I can’t always cut. However, you know that is something that I love. You know that it's people that I love. It's a subject that I love and I talk about all the time. So our next series….”For The Love of Food,” of course. Of course, you guys. Wait until you hear some of our guests. We’ve have got chefs and Food Network stars and cookbook authors and all sorts of amazing people. You are going to love it. It's going to be fun and interesting. You don’t even have to like food, you guys. We will talk about all sorts of things around the table; hospitality, community hosting, when you're not a cook. Everything it's all going to be in there. Plus these people are delightful. Absolutely delightful. So you're not going to want to miss next week when we kick off For The Love of Food. As always, thank you for joining us. Thank you for your feedback. We've learned so much from your responses. Thank you for letting us know what you'd love to see and what you'd love to hear. We are paying attention and we are listening, as we sort of craft the future of the podcast for the next six months to a year or so anyway. Love having you as a subscriber. Absolutely love having you as a listener--it's my joy to come here every single week. So you guys have a great week and we'll catch you next time with For the Love of Food. and take the results to their child's pediatrician. The M-CHAT is a validated developmental screening tool for toddlers between 16 and 30 months of age. 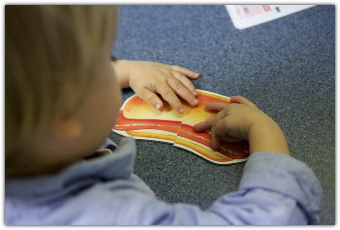 It is designed to identify children who may benefit from a more thorough developmental and autism evaluation. 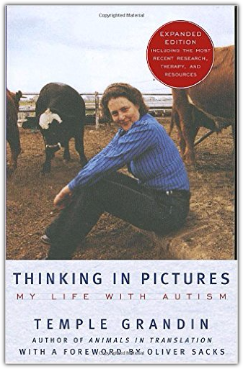 by Barry M. Prizant, Ph.D.
Chrissy recommends anything written by Temple Grandin but particularly ^THIS^ book, Thinking in Pictures: My Life with Autism. 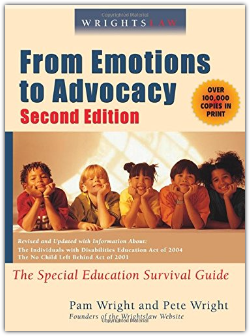 From Emotions to Advocacy, a must read.